Homologous recombination involving sister chromatids is the most accurate, and thus most frequently used, form of recombination-mediated DNA repair. Despite its importance, sister chromatid recombination is not easily studied because it does not result in a change in DNA sequence, making recombination between sister chromatids difficult to detect. We have previously developed a novel DNA template strand sequencing technique, called Strand-seq, that can be used to map sister chromatid exchange (SCE) events genome-wide in single cells. An increase in the rate of SCE is an indicator of elevated recombination activity and of genome instability, which is a hallmark of cancer. In this study, we have adapted Strand-seq to detect SCE in the yeast Saccharomyces cerevisiae. We provide the first quantifiable evidence that most spontaneous SCE events in wild-type cells are not due to the repair of DNA double-strand breaks. Homologous recombination (HR) is indispensable for the maintenance of genome integrity, and mutations in many HR genes are linked to a number of human diseases, especially various types of cancer (Prakash et al., 2015). HR is characterized as a major pathway to repair DNA double-strand breaks (DSBs), and can occur between any two homologous sequences, such as sister chromatids, homologous chromosomes, or homologous sequences located at different genomic loci (Jasin and Rothstein, 2013). HR results in a unidirectional transfer of genetic information from one DNA molecule to another (i.e. gene conversion) and/or a reciprocal exchange of genetic information between the two DNA molecules (i.e. a crossover). A crossover involving two homologous chromosomes can cause loss of heterozygosity, which is a common occurrence in cancer, while a crossover involving homologous sequences located at different genomic loci will result in chromosomal rearrangements, such as deletions, inversions, and translocations, which have been linked to a variety of human diseases (Kong et al., 2011). Thus, in mitotic cells, HR is biased towards noncrossovers, and HR involving identical sister chromatids, referred to as sister chromatid recombination (SCR), is preferred (Kadyk and Hartwell, 1992; Nassif et al., 1994; Johnson and Jasin, 2000; Virgin et al., 2001; Stark and Jasin, 2003), in part because a crossover during SCR should not lead to a change in DNA sequence. However, studying SCR has been difficult, precisely because it does not normally result in a change in DNA sequence. Nevertheless, an SCR event that leads to a crossover, referred to as a sister chromatid exchange (SCE), can be detected. The mechanistic details of SCE and HR have been best studied using genetic assays in the budding yeast Saccharomyces cerevisiae (Symington et al., 2014), though these assays are limited in several ways. First, perfect, or ‘equal’, chromosomal SCE events cannot be detected genetically, so most SCE assays measure ‘unequal’ SCE events, requiring recombination between misaligned sister chromatids. However, using a plasmid-based assay that creates a DSB on one of the two sister plasmids after DNA replication, equal SCE was found to occur much more frequently than unequal SCE (González-Barrera et al., 2003). Second, an often-used approach for detecting unequal SCE involves using two overlapping segments of a reporter gene in a tail-to-head configuration (Fasullo and Davis, 1987). The generation of a full-length reporter gene can result from an unequal SCE event, but it can also result from a long-tract gene conversion event, which does not involve a crossover. These two outcomes can be distinguished by analysis of sectored colonies (Kadyk and Hartwell, 1992), but this additional analysis is often not performed. Third, these assays measure recombination at a single genetic locus by introducing genetic markers at the locus. Introduction of such ‘reporter cassettes’ may disrupt the native chromatin environment, which could affect HR at the locus. Assaying recombination only at a single locus also ignores the rest of the genome. Some proteins important for HR may only affect specific regions of the genome, so these assays would not be useful to elucidate their functions. Lastly, most genetic assays rely on the outgrowth of a recombined cell. Thus, recombination events that lead to a reduction in cell proliferation capacity will be underrepresented, or left uncharacterized. To alleviate these limitations, we previously developed a DNA template strand sequencing technique, called Strand-seq, which is capable of detecting SCE events genome-wide in single cells (Falconer et al., 2012). In Strand-seq, cells are allowed to divide once in the presence of bromodeoxyuridine (BrdU), a synthetic analogue of thymidine. BrdU gets incorporated into the newly synthesized DNA strands. 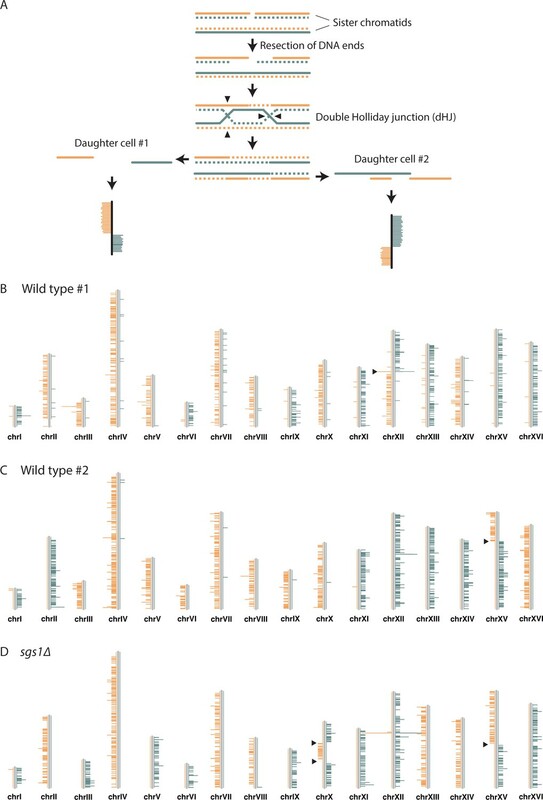 Single daughter cells are isolated and the nascent DNA strands are selectively degraded to isolate parental template strands for the construction of directional sequencing libraries. Multiple single-cell libraries containing unique index sequences are pooled and sequenced on an Illumina platform. Aligned reads are binned into non-overlapping segments and plotted as coloured horizontal lines along an ideogram of each chromosome. An SCE is revealed by a switch in reads mapping to the Watson strand to reads mapping to the Crick strand, or vice versa (Figure 1A). Strand-seq was originally developed for use with mammalian cells. However, since most mammalian cells are diploid, it is not easy to differentiate between an SCE from an interhomolog recombination event. Yeast, on the other hand, can be studied in both haploid and diploid states, and the molecular details of HR are best known from studies in yeast. Thus, we have adapted the Strand-seq approach to work with yeast cells. We observe that 23% of wild-type cells have at least one SCE—the first time spontaneous SCEs have been measured and mapped genome-wide in yeast. Interestingly, our findings suggest that most spontaneous SCE events are not due to the repair of DSBs. Detection of SCE events using Strand-seq. (A) An SCE can occur as a result of DSB repair. Two sister chromatids, one of which has a DSB, are shown. The parental template DNA strands are depicted with solid lines, while the newly synthesized strands containing BrdU are depicted with dashed lines. The Watson and Crick strands are shown in orange and blue, respectively. DSB repair by SCR can lead to the formation of a double Holliday junction (dHJ). Resolution of the dHJ by structure-specific endonucleases will result in either a noncrossover (not shown) or a crossover. The resulting sister chromatids are then segregated to two different daughter cells. In the current Strand-seq protocol, only one daughter cell is isolated and analyzed. The BrdU-containing strands are nicked during library preparation, resulting in the sequencing of only parental strands. Sequence reads are mapped to either side of a chromosome ideogram. An SCE results in a switch from Watson to Crick reads along the chromosome. Note: the small gap between the parental strands in daughter cell #1 and the small overlap of the parental strands in daughter cell #2 are too small to be detected with Strand-seq. (B) An example of a wild-type Strand-seq library. Ideograms of the 16 yeast chromosomes are shown. Orange and blue lines correspond to reads aligning to the Watson and Crick strands, respectively. This cell inherited either the parental Watson strand or the parental Crick strand for each chromosome, except chromosome XII. A switch from Watson to Crick reads can be seen for chromosome XII (black arrowhead), indicating that an SCE event has occurred. (C) A second example of a wild-type Strand-seq library. An SCE event was detected on chromosome XV. (D) An example of an sgs1∆ Strand-seq library. Three SCE events were detected in this library: two on chromosome X and one on chromosome XV. S. cerevisiae cells are unable to ‘salvage’ nucleosides from the environment, so to perform Strand-seq with yeast cells, we use yeast strains that express both Drosophila melanogaster deoxyribonucleoside kinase (dNK) and the human equilibrative nucleoside transporter (hENT1), allowing cells to take up and incorporate exogenous thymidine and BrdU into their DNA (Vernis, 2003). CDC21, which encodes thymidylate kinase, is also deleted in these strains, forcing them to be entirely dependent upon exogenous thymidine for viability. When grown in the presence of BrdU, these strains do not show any cell cycle delay or DNA damage checkpoint activation during the first cell cycle (Vernis, 2003). In addition, we see no significant difference in Rad52 focus formation, a sensitive indicator of recombination activity (Lisby et al., 2001), after 90 min of growth in BrdU-containing medium, suggesting that BrdU does not stimulate SCE (Figure 1—figure supplement 1). Although we cannot exclude the possibility that BrdU incorporation causes DNA damage that induces SCE in a manner that does not elicit a DNA damage checkpoint response or Rad52 focus formation, these findings are in line with our recently reported observation that BrdU incorporation also does not induce SCE in human cells, at least during the first two cell divisions, as varying the concentration of BrdU in the culture medium does not affect the frequency of SCE (van Wietmarschen and Lansdorp, 2016). We release dNK- and hENT1-expressing cdc21∆ yeast cells synchronously from a G1 arrest into medium supplemented with BrdU and monitor cell cycle progression by flow cytometry. Cells that undergo precisely one cell division are isolated by cell sorting, followed by single cell Strand-seq library preparation (Sanders et al., 2017). Two examples of wild-type Strand-seq libraries, each containing one SCE, are shown in Figure 1B and C. We sequenced Strand-seq libraries derived from 218 wild-type cells and observed a total of 57 SCE events, which equates to 0.26 SCE events per cell (Figure 2A, Table 1). 23% of wild-type cells have at least one SCE (Figure 2B). Measurement of spontaneous SCE genome-wide in single cells. (A) Number of SCE events per cell for the indicated genotypes. (B) Percentage of cells with the indicated number of SCE events for each genotype. (C) Number of SCE events per cell for wild-type yeast, human fibroblasts, human lymphoblasts, and mouse ES cells. (D) SCE events per gigabase of DNA for wild-type yeast, human fibroblasts, human lymphoblasts, and mouse ES cells. Comparison of SCE by genotype. To validate our approach, we analyzed SCE in a hyperrecombinogenic strain (sgs1∆), and in a strain lacking Rad52 (a key HR protein important for all HR-mediated activities). Mutation of BLM, the human homolog of SGS1, increases SCE (German et al., 1965; Chaganti et al., 1974; van Wietmarschen and Lansdorp, 2016), and deletion of SGS1 has been reported to increase unequal SCE using two different genetic assays (Onoda et al., 2000; Fasullo and Sun, 2017). The evolutionarily conserved Sgs1-Top3-Rmi1 complex is thought to suppress SCE by dissolving a recombination intermediate known as the double Holliday junction (dHJ; see Figure 1A) in a manner that would result in a non-crossover (Ira et al., 2003; Wu and Hickson, 2003). Consistent with these findings, we observe an increase in SCE in sgs1∆ cells (p<10−9) using Strand-seq (Figure 1D; Figure 2A and B; Table 1). In addition, we did not detect any SCE events in rad52∆ cells, as expected (Figure 2A and B; Table 1). The Strand-seq approach allows us to directly and quantitatively compare recombination activity in cells from yeast and mammals. Using previously reported Strand-seq data from mouse embryonic stem cells (Falconer et al., 2012) and human fibroblasts and lymphoblasts (van Wietmarschen and Lansdorp, 2016), we find that spontaneous SCE events per cell is about an order of magnitude greater in human and mouse cells than in wild-type yeast cells (Figure 2C). However, the human and mouse genomes are much larger than the yeast genome. By plotting the number of SCE events per gigabase of DNA, it is apparent that SCE activity is about 20-fold higher in yeast (Figure 2D). It is generally thought that yeast is more recombinogenic than mammals, but a direct and quantitative comparison has not been available until now. Currently, we are only able to map SCE events to a resolution of approximately 30 kb (Figure 3A), which, combined with the modest number of SCE events we have detected so far (57 total from 218 wild-type Strand-seq libraries; Table 1), prevents us from mapping SCE events to specific genomic loci or features. However, multiple SCE events were seen at the ribosomal DNA (rDNA) locus, which is located on chromosome XII and consists of approximately 150 rDNA repeats, each of which is 9.1 kb in size (the SCE event in the Strand-seq library shown in Figure 1B maps to the rDNA locus). Since the repeats are identical in sequence, we cannot determine where within the ~1.4 Mb rDNA locus an SCE event occurs. Therefore, we only report whether or not an SCE has occurred somewhere within the rDNA locus. Of the 57 spontaneous SCE events we observed in our wild-type Strand-seq libraries, 14 were found at the rDNA locus (Table 1). We find that the rate of spontaneous SCE per gigabase of DNA in the rDNA locus is about threefold higher compared to the rest of the genome. This result was observed both in the presence and absence of Sgs1 (Figure 3B), and is likely due to the presence of the replication fork barrier within each rDNA repeat (Labib and Hodgson, 2007). (A) Mapping resolution of SCE events in all yeast Strand-seq libraries and by genotype. The red line shows the median mapping resolution for all libraries. SCE events within the rDNA locus are excluded from this analysis because it is not possible to determine where within the rDNA an SCE event has occurred. (B) SCE events per gigabase of DNA, for either the entire genome excluding the rDNA locus or only considering the rDNA locus, were plotted for the indicated genotypes. Rad52 has two main biochemical functions. First, Rad52 mediates the exchange of replication protein A (RPA) for Rad51 on single-stranded DNA (ssDNA) to promote Rad51-catalyzed strand invasion (Sung, 1997; New et al., 1998). Second, Rad52 facilitates the annealing of complementary RPA-coated ssDNA, a function that is independent of Rad51 (Mortensen et al., 1996; Shinohara et al., 1998; Sugiyama et al., 1998) and augmented by Rad59 (Petukhova et al., 1999; Davis and Symington, 2001; Wu et al., 2006). To determine which function of Rad52 is important for SCE, we performed Strand-seq on rad51∆ and rad52-Y66A mutant cells. rad52-Y66A belongs to a class of rad52 mutants, class C mutants, that are mutated in the evolutionarily conserved N-terminal domain and share a similar phenotype of being proficient for mitotic recombination, but defective in the repair of DSBs (Mortensen et al., 2002). An in vitro study of one of the class C mutant proteins, rad52-R70A, indicated that these mutants are defective in strand annealing activity (Shi et al., 2009). We find that SCE is reduced 1.7-fold in rad51∆ cells and 4.5-fold in rad52-Y66A cells (p=0.058 and p<10−4 for rad51∆ and rad52-Y66A, respectively; Figure 2A and B; Table 1), indicating that both functions of Rad52 are important for spontaneous SCE, with the strand annealing function being more so. This observation is in agreement with previous work indicating that the strand annealing activity of Rad52 is important for DSB-induced SCR (Muñoz-Galván et al., 2013). Using a genetic assay that detects unequal SCE, it was previously reported that Rad51 is not required for spontaneous SCE (Fasullo et al., 2001). However, this study did not assess the contribution of long-tract gene conversion in their assay, which may have obscured an actual decrease in unequal SCE in the rad51∆ mutant. Interestingly, the effect of rad51∆ and rad52-Y66A on SCE is restricted to outside of the rDNA locus (3.2-fold [p=0.002] and 15-fold [p<10−6] reduction, respectively, compared to wild type; Figure 3B). Within the rDNA locus, SCE in rad51∆ and rad52-Y66A is not significantly altered (p=0.48 and p=0.71, respectively). This observation is consistent with a previous study showing that spontaneous Holliday junction formation within the rDNA locus is dependent on Rad52, but not Rad51 (Zou and Rothstein, 1997). Taken together, the evidence suggests that Rad52 may have a function independent of Rad51 and strand annealing at the rDNA locus. It is often thought that SCE events are the result of the repair of DSBs (as depicted in Figure 1A). To investigate the role of DSBs in the generation of spontaneous SCE events in yeast, we compared the rate of spontaneous SCE in wild-type cells to the rate of DSB formation. Spontaneous DSB rate can be estimated by the rate of cell death in a rad52∆ mutant, which cannot repair DSBs (Coïc et al., 2008; Mehta and Haber, 2014). A single unrepaired DSB is sufficient to kill a rad52 mutant cell (Weiffenbach and Haber, 1981). Thus, we used the mortality rate of our rad52∆ strain to estimate the rate of spontaneous DSB formation, which we found to be 12% per cell division (see Materials and methods). Using direct-repeat recombination assays to detect unequal SCR events, one quarter of spontaneous (two of eight recombinants) and one third of X-ray-induced (four of 12 recombinants) SCR events were found to be accompanied by a crossover (Jackson and Fink, 1981; Kadyk and Hartwell, 1992). Therefore, if all spontaneous SCE events are the result of DSB repair, the rate of spontaneous SCE should be 3–4%. This rate represents an upper limit, because if Rad52 repairs other types of DNA damage that could lead to cell death if unrepaired, we would have overestimated the rate of spontaneous DSB formation. In contrast to this 3–4% upper limit, we find that 20% (43 out of 218, 95% CI [15%, 26%]) of wild-type Strand-seq libraries have at least one SCE not at the rDNA locus. We exclude SCE events that map to the rDNA locus because a DSB in the rDNA locus can be repaired by single-strand annealing in the absence of Rad52 due to the highly repetitive nature of the locus (Ozenberger and Roeder, 1991). Therefore, our results suggest that the majority of spontaneous SCE events are not the result of DSB repair. Spontaneous HR initiated by non-DSB damage has been reported before, so we investigated whether the same lesion could be responsible for spontaneous SCE. 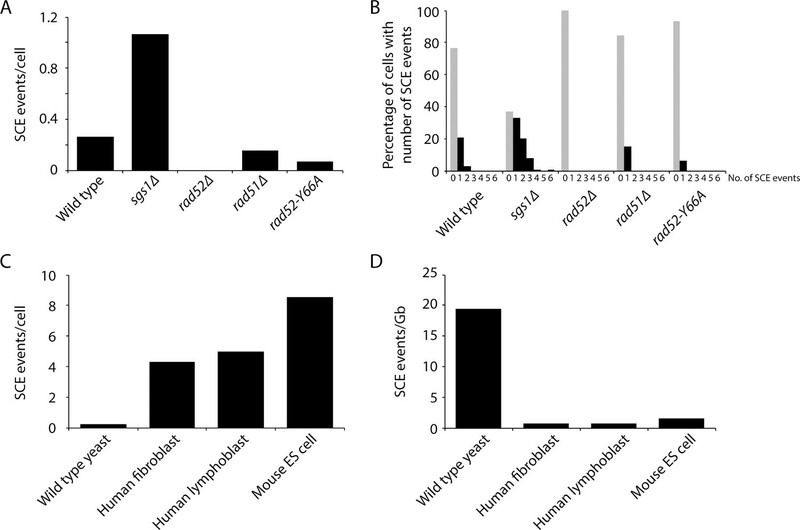 For example, cells lacking both Sgs1 and the structure-specific endonuclease Mus81 are inviable, but this lethality can be suppressed by mutations in the RAD52 epistasis group (i.e. RAD51, RAD52, RAD54, RAD55, and RAD57), indicating that mus81∆ sgs1∆ synthetic lethality is due to a toxic recombination intermediate (Fabre et al., 2002). Since Rad52 is required for the repair of DSBs, Fabre and colleagues argued that the toxic recombination intermediate cannot be initiated by a DSB. Similarly, cells lacking Top3 or Rmi1 grow very poorly, but this slow growth can be suppressed by mutations in SGS1 or the members of the RAD52 epistasis group, supporting a model where Rad52 and Sgs1 function in a pathway to repair a spontaneous non-DSB lesion, in the process creating a toxic recombination intermediate requiring Top3 and Rmi1 to resolve (Gangloff et al., 1994; Shor et al., 2002; Chang et al., 2005; Mullen et al., 2005). Unlike rad51∆ and rad52∆, which can suppress the synthetic lethality of mus81∆ sgs1∆ and the slow growth of rmi1∆ (Fabre et al., 2002; Chang et al., 2005), we find that rad52 class C mutants, which are defective in Rad52-mediated strand annealing (Shi et al., 2009) and spontaneous SCE (Figure 2A and B), cannot suppress either phenotype (Figure 4). These findings indicate that the DNA lesion(s) that cause mus81∆ sgs1∆ synthetic lethality and rmi1∆ slow growth are different than the DNA lesion(s) that cause spontaneous SCE in wild-type cells, and that HR is important to repair multiple types of endogenous DNA damage. Abolishing the strand annealing activity of Rad52 does not suppress mus81∆ sgs1∆ synthetic lethality or rmi1∆ slow growth. (A) Representative tetrads derived from the sporulation of MCY736, MCY737, and MCY773 are shown. (B) Representative tetrads derived from the sporulation of CCY198 are shown. Colony sizes for the indicated genotypes were measured and normalized to wild type. Mean ±SEM is shown. Lack of suppression of mus81∆ sgs1∆ synthetic lethality and rmi1∆ slow growth was also observed using another rad52 class C mutant: rad52-R70A (data not shown). In this study, we have used Strand-seq to measure SCE genome-wide in individual yeast cells. We provide evidence that the majority of spontaneous SCE events in wild-type cells are not the result of DSB repair. Non-DSB lesions have also been invoked to explain the synthetic lethality of mus81∆ sgs1∆ and sgs1∆ srs2∆ mutants (Fabre et al., 2002) and the proficiency of rad52 class C mutants for spontaneous inter- and intrachromosomal heteroallelic HR (Lettier et al., 2006). While the strand annealing activity of Rad52 is important for spontaneous SCE, it is not in the other noted instances of spontaneous HR, indicating that there must be at least two types of endogenous non-DSB lesions processed by HR. These lesions could be single-stranded nicks or gaps, as proposed in many of the original models for HR (Holliday, 1964; Meselson and Radding, 1975; Radding, 1982), or other type of structures interfering with strand-specific replication (Figure 5A and B). Indeed, it is well known that single-stranded gaps can initiate recombination in Escherichia coli (Persky and Lovett, 2008) and that fork collapse at the polar replication fork barrier RTS1 in Schizosaccharomyces pombe induces HR-dependent replication restart from a single-stranded gap (Lambert et al., 2010). Models of SCE that do not involve a DSB. As in Figure 1A, the parental template DNA strands are depicted with solid lines, while the newly synthesized strands are depicted with dashed lines. The Watson and Crick strands are shown in orange and blue, respectively. (A) An SCE could be generated from the repair of an ssDNA gap. This could proceed via inverse strand exchange, where Rad52 forms a complex with dsDNA and promotes strand exchange with a homologous ssDNA sequence independently of Rad51 (Mazina et al., 2017). (B) A DNA lesion on one of the parental template strands can cause template switching, where nascent DNA is used as a template for DNA replication, and could result in SCE. (C) As in B), but the ‘DNA lesion’ is an inverted DNA repeat forming a hairpin loop. The importance of strand annealing for spontaneous SCE is reminiscent of recombination involving inverted repeats, which requires Rad52 but is only modestly reduced by deletion of RAD51 (Rattray and Symington, 1994). Rad59, which augments the strand annealing function of Rad52 (Petukhova et al., 1999; Davis and Symington, 2001; Wu et al., 2006), is required for spontaneous recombination of inverted repeats in the absence of Rad51 (Bai and Symington, 1996). 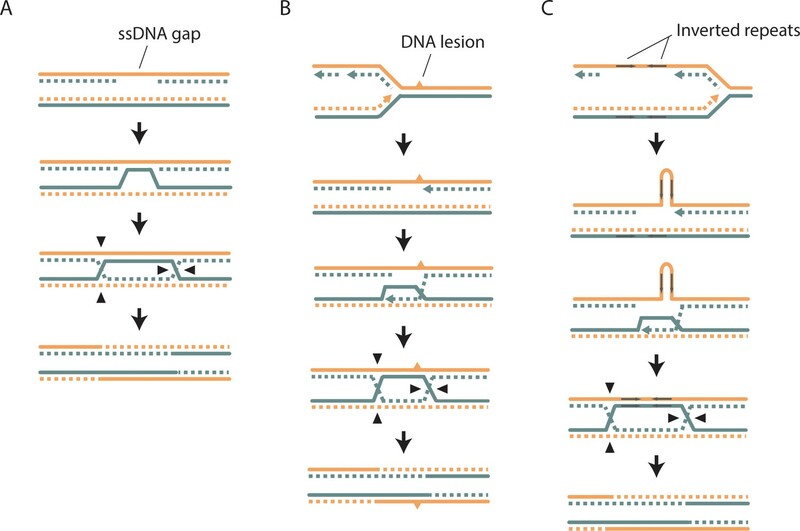 It has been proposed that these events occur by template switching during DNA replication in a manner involving strand annealing (Mott and Symington, 2011). Poly-ubiquitylation of PCNA by the Mms2-Ubc13-Rad5 ubiquitin conjugating enzyme complex promotes repair through the error-free post-replication repair pathway, which is thought to involve template switching (Xu et al., 2015). 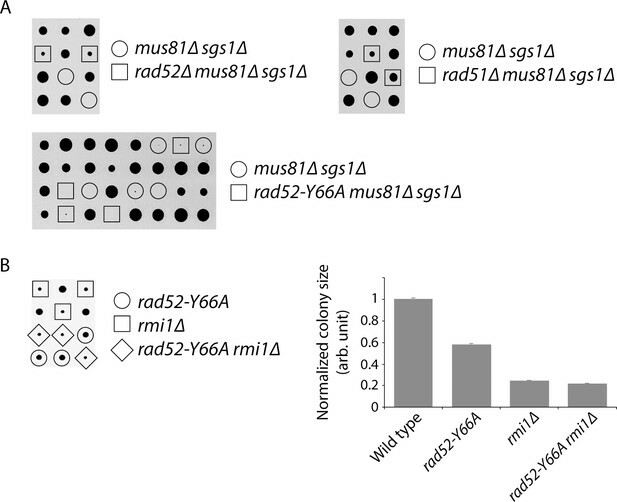 Rad5 and Rad18 were found to have only a minor role in inverted-repeat recombination (Mott and Symington, 2011), and the rates of spontaneous SCE in mms2∆, ubc13∆, and rad5∆ mutants are similar to wild type, as measured by an unequal SCE assay (Fasullo and Sun, 2017). 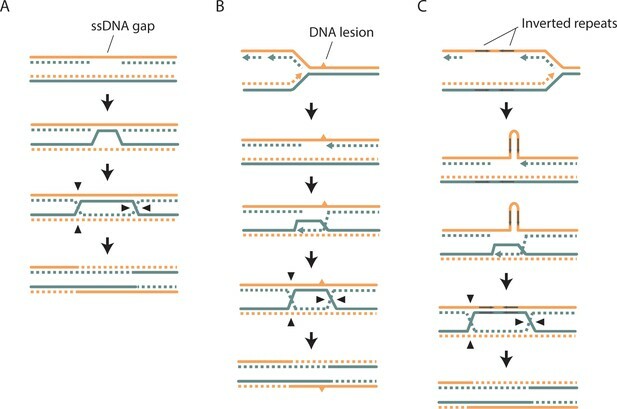 However, template switching has been proposed to occur differently depending on whether the DNA lesion is on the leading strand template or the lagging strand template, with lesion bypass on the leading strand utilizing Rad5 while lesion bypass on the lagging strand mediated by Rad52 (Gangavarapu et al., 2007). Aside from the rDNA locus, we have so far been unable to map spontaneous SCE events to specific genomic features so further work will be needed to determine whether inverted repeats replicated by the lagging strand machinery are a source of spontaneous SCE (Figure 5C). We were able to map multiple spontaneous SCE events to the rDNA locus because of its large size (approximately 10% of the genome). Due to its repetitive nature, the rDNA locus has been an excellent substrate for studying HR. Recombination within the locus is important to maintain repeat homogeneity and copy number homeostasis (Kobayashi, 2011). Consistent with the importance of HR at the rDNA locus, we observe that SCE is threefold higher at the rDNA locus compared to the rest of the genome (Figure 3B). Nevertheless, an SCE event occurs at the rDNA locus in only 6.4% (14 out of 218) of wild-type cells (Table 1). Considering that it has been estimated that a single cell has on average 3.6 Holliday junctions and one DSB within the rDNA array per cell cycle (Zou and Rothstein, 1997; Sasaki and Kobayashi, 2017), our data indicate that the vast majority of HR events at the rDNA locus do not result in crossovers, in agreement with previous work showing that HR at the rDNA locus is largely rearrangement-free (Zou and Rothstein, 1997). In addition to SCE, Strand-seq could in theory be used to detect break-induced replication (BIR) events involving sister chromatids. BIR occurs when one end of a DSB invades an intact homologous DNA sequence to generate a replication fork that can potentially proceed to the end of the chromosome. Unlike canonical DNA replication, which is semi-conservative, BIR occurs by conservative DNA synthesis (Donnianni and Symington, 2013; Saini et al., 2013). With Strand-seq, a chromosomal region synthesized by BIR could either have no Watson or Crick reads (i.e. both Watson and Crick strands are newly synthesized) or both Watson and Crick reads (i.e. both Watson and Crick strands consist of the original parental template strands). Application of Strand-seq in yeast will be particularly advantageous to address questions about various types of DNA lesions and replication stress-inducing barriers at specific locations in the genome. These and other potential applications of Strand-seq offer intriguing new possibilities to study HR, complimenting more traditional assays to yield a better picture of HR activity genome-wide at the level of single cells. Strains used in this study are listed in Table 2 and are all RAD5 derivatives of W303 (Thomas and Rothstein, 1989; Zhao et al., 1998). The E17 strain was derived from YLV11 (Vernis, 2003). Unless noted otherwise, standard culturing conditions and genetic techniques were used to manipulate yeast strains (Sherman, 2002). Strand-seq compatible strains (cdc21::kanMX leu2::LEU2-GAL-hENT1 trp1::TRP1-GAL-dNK) were grown in 25 ml of YP medium (1% yeast extract, 2% peptone) supplemented with 2% galactose (YPGal) and 100 µM thymidine to an OD600 of 0.2–0.4. Cells were arrested in G1 phase by the addition of alpha mating factor (Sigma) for 2 hr. At this point, two different protocols were used: the first involved sorting single cells, while the second involved sorting individual spheroplasts. Both protocols yielded high quality Strand-seq libraries, with no change in the number of SCE events observed per cell (Figure 6A), nor in SCE mapping resolution (Figure 6B), but the spheroplast approach proved to be more reliable with less background sequencing reads. The Strand-seq library shown in Figure 1B was derived from the cell sorting approach, while the Strand-seq libraries shown in Figure 1C and D were derived from the spheroplast sorting approach. The spheroplast-sorting approach compared to the cell-sorting approach in terms of (A) number of SCE events per cell (divided by genotype) and (B) SCE mapping resolution. For the cell sorting approach, G1-arrested cells were washed with water and resuspended in 100 µl of PBS solution. 150 µl of 200 µg/ml of Concanavalin A (ConA), conjugated to either Cy5 or Alexa Fluor 633, was then added, followed by a 10 min incubation at room temperature in the dark. ConA binds to the yeast cell wall (Tkacz et al., 1971). Unbound ConA was removed by washing three times with PBS. Cells were then synchronously released from G1 arrest into fresh YPGal supplemented with 0.6 mg/ml of BrdU. Samples were taken before G1 arrest, after G1 arrest, after ConA-labeling, and every 30 min after release from G1 arrest. The samples were fixed with 70% ethanol and stored for at least one night at −20°C. Cells were pelleted, resuspended in 0.5 ml of 50 mM Tris-Cl pH 8.0 plus 10 µl of 10 mg/ml RNase A, and incubated for 2–4 hr at 37°C. The cells were then washed once with 50 mM Tris-Cl pH 7.5, resuspended in 300 µl of 50 mM Tris-Cl pH 7.5, 1.5 µM SYTOX Green, and incubated overnight at 4°C. 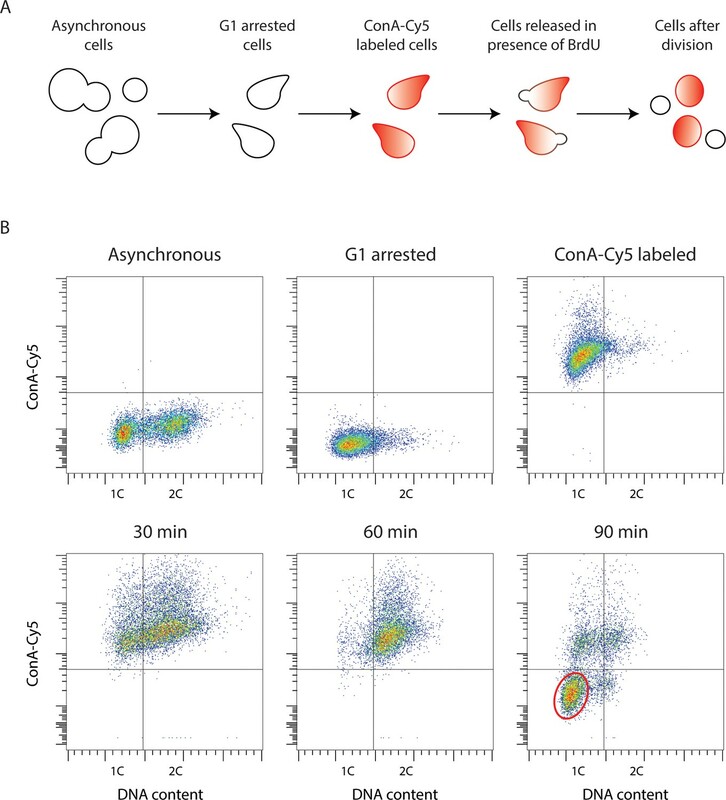 Cell suspensions were briefly sonicated and analyzed by flow cytometry. Newly divided daughter cells can be identified by having 1C DNA content and without ConA labeling, since yeast daughter cells bud off from the original mother cells, synthesizing a new cell wall that is not stained with ConA (Chung et al., 1965; Figure 7). The single daughter cells were then sorted with a MoFlo Astrios cell sorter (Beckman Coulter) into separate wells of a 96-well plate for Strand-seq library preparation. Yeast Strand-seq via the 'single cell sorting' approach. (A) Scheme of the ‘single cell sorting’ approach for yeast Strand-seq. (B) Representative flow cytometry scatter plots corresponding to the scheme depicted in (A). Cells appearing in the lower left quadrant in the 90 min post-release sample are newly divided daughter cells to be sorted. A typical window for sorting is shown by the red oval. For the spheroplast sorting approach, G1 arrest and release into BrdU-containing media was performed as in the cell sorting protocol, with the omission of ConA-labeling. Cell cycle progression was monitored by flow cytometry. Cells that had progressed through one cell cycle were incubated 0.17 mg/ml zymolyase for 1 hr at 37°C. The resulting spheroplasts were washed in PBS and those with 1C DNA content were sorted with a FACSJazz cell sorter (BD Biosciences) into separate wells of a 96-well plate for Strand-seq library preparation. Without the ConA-labeling, we cannot distinguish newly divided cells from cells that remain arrested in G1 without having progressed through the cell cycle. However, the arrested cells will not have incorporated BrdU, resulting in Strand-seq libraries that will have both Watson and Crick reads for every chromosome. These libraries can be easily identified and discarded. Moreover, we find that the occurrence of such libraries is very rare. Strand-seq libraries were prepared as previously described (Sanders et al., 2017), with a few modifications. Sorted single yeast cells were first treated with zymolyase, followed by incubation with MNase to fragment the DNA. Several zymolyase reaction conditions were used in an attempt to optimize the procedure. In the end, we found that 0.175 mg/ml zymolyase for 30 min at 30°C worked best. Sorted single spheroplasts were directly subjected to MNase treatment. Adapter ligation was performed in the presence of PEG 6000, using the Quick Ligation Reaction Buffer (New England Biolabs) and 10 nM adapters to promote efficient ligation of adapters to DNA templates and reduce adapter dimer formation. After ligation and PCR, DNA clean-up with magnetic AMPure XP beads (Agencourt AMPure, Beckman Coulter) was performed twice using a 1.2 vol of beads. Single-end 50 bp sequencing reads from the Strand-seq libraries were generated using the HiSeq 2500 or the NextSeq 500 sequencing platform (Illumina, San Diego, CA). Reads were aligned to the S. cerevisiae EF4 reference genome using Bowtie2 (version 2.0.0-beta7; Langmead and Salzberg, 2012) and analyzed using the BAIT software package (Hills et al., 2013) for data selection and visualization purposes. Only libraries with an average read count greater than 20 per megabase of DNA were included in the analyses. SCE events were detected using an R-based package called HapSCElocatoR (publicly available through GitHub: https://github.com/daewoooo/HapSCElocatoR; Porubský and Sanders, 2017 ; copy archived at https://github.com/elifesciences-publications/HapSCElocatoR). HapSCElocatoR uses circular binary segmentation (implemented in the R package fastseg; Klambauer et al., 2012) to localize SCE events in haploid Strand-seq libraries as a change in read directionality from Watson (negative strand) to Crick (positive strand) or vice versa. Only non-duplicate reads with a mapping quality greater than or equal to 10 were analyzed. We considered only strand state changes with at least three directional reads on both sides of the putative SCE site as an SCE event. Single directional reads embedded within an extended region with the opposite directionality were considered as errors and their directionality was flipped. Computationally localized SCE events were further manually verified by visual inspection of chromosome ideograms (obtained from BAIT; see Figure 1B). Comparisons of SCE rate between different genotypes were assessed for statistical significance using a t-test. Strains CCY232 and CCY234 were inoculated in the morning in 2 mL of synthetic medium supplemented with 100 µM thymidine and grown at 25°C. In the evening, the cultures were diluted into 50 mL of synthetic medium supplemented with thymidine to reach an OD600 of 0.2–0.4 in the following morning. Cells were then washed twice with synthetic medium and placed either into 25 mL of synthetic medium supplemented with 100 µM thymidine (for CCY232 and CCY234) or 25 mL of synthetic medium supplemented with 200 µM BrdU (for CCY232) and grown for 90 min at 25°C—instead of 30°C, to allow the GFP chromophore to fold more efficiently (Lim et al., 1995). Cells were then mounted onto agar pads for imaging, which was performed using a Zeiss LSM 800 or a DeltaVision Image Restoration Microscope. Images were scores for cells with or without foci by two people independently. Freshly grown E17 (wild type) or CCY193 (rad52∆) were spread onto one side of a YPGal +100 µM thymidine plate. Cells were micromanipulated to designated locations on the plate and allowed to divide once. If a cell failed to divide at this stage, it was discarded from further analysis. This step ensured that we would look at healthy and newly divided cells. From the cells that do divide, each daughter cell was then micromanipulated away from its mother cell to a new location on the same plate, which was then incubated for 2–3 days at 30°C to allow the isolated mother and daughter cells to form colonies. The number of mother or daughter cells that were unable to form a colony was recorded. Incidences where both the mother and the daughter did not form a colony were excluded from the analysis because these mother-daughter pairs may have resulted from the division of an arrested cell with unrepaired DNA damage as a result of DNA damage checkpoint adaptation (Clémenson and Marsolier-Kergoat, 2009). In total, 408 E17 and 338 CCY193 cells were examined (i.e. 204 E17 and 169 CCY193 mother-daughter pairs). 13.3% (95% CI [9.9%, 17.4%]) of CCY193 cells and 1.7% (95% CI [0.7%, 3.5%]) of E17 cells failed to form a colony. E17 mortality is unlikely due to unrepaired DSBs, and possibly due to death caused by the micromanipulation process, so subtracting this 1.7% ‘background’ mortality rate from the 13.3% mortality rate of CCY193 cells yields an estimated spontaneous DSB rate of 11.6%. This mortality rate is similar to the 8.3% previously reported for rad52∆ of a different strain background (Ozenberger and Roeder, 1991). Canadian Journal of Microbiology 11:953–957. Molecular and Cellular Biology 27:7758–7764. Molecular and Cellular Biology 14:8391–8398. Cold Spring Harbor Perspectives in Biology 5:a012740. Cellular and Molecular Life Sciences 68:1395–1403. Replication fork barriers: pausing for a break or stalling for time? The Journal of Biochemistry 118:13–17. Cold Spring Harbor Perspectives in Biology 6:a016428. Molecular and Cellular Biology 25:4476–4487. Molecular and Cellular Biology 14:1613–1625. Molecular and Cellular Biology 11:1222–1231. Critical Reviews in Biochemistry and Molecular Biology 43:347–370. Journal of Biological Chemistry 274:33839–33842. Annual Review of Genetics 16:405–437. Journal of Biological Chemistry 284:33275–33284. Molecular and Cellular Biology 23:733–743. Journal of Biological Chemistry 272:28194–28197. Molecular and Cellular Biology 1:522–534. Journal of Biological Chemistry 281:15441–15449. Mutation Research/Reviews in Mutation Research 764:43–50. Thank you for sending your article entitled "Double-strand breaks are not the main cause of spontaneous sister chromatid exchange in wild-type yeast cells" for peer review at eLife. Your article has been favorably evaluated by Jessica Tyler (Senior Editor) and three reviewers, one of whom is a member of our Board of Reviewing Editors. The reviewers recognize the importance of sister chromatid exchange and the potential of Strand-seq to measure the number and distribution of these events genome wide. The two main concerns identified by the reviewers are: (1) could the high frequency of SCEs result from the method used to detect them; and (2) validity of the argument regarding the source of the initiating lesion of SCEs. Essentially, the concern is that the conditions used to incorporate BrdU into the genome are non-physiological and could result in DNA damage that then leads to sister chromatid exchange. Reviewer 2 suggests specific experiments that could be used to address this concern. In particular, determining viability of rad52 cells under the same conditions used for Strand-seq. Activation of the DNA damage and/or replication checkpoint could also be assessed under these conditions. In this study, the authors apply a method called Strand-seq to determine the number and distribution of spontaneous sister chromatid exchanges (SCE) in the yeast, Saccharomyces cerevisiae. The advantage of this method over previously described assays in yeast, is that it measures events genome wide in a single generation, and reports on equal sister chromatid recombination in contrast to genetic assays that are usually designed to detect unequal recombination between repeated gene segments at a single locus. Yeast is an ideal system for Strand-seq because of the stable haploid state, which avoids complications due to inter-homolog recombination, and plethora of mutants available to investigate the role of genes in known DNA repair pathways in regulating sister chromatid recombination. The authors found that 23% of wild type daughter cells analyzed had at least one SCE and these events were dependent on RAD52, and only partially dependent on RAD51. Interestingly, the rad52-Y66A allele, anticipated to be defective in the strand annealing function of Rad52, exhibited a greater decrease in SCEs outside of the rDNA than the rad51 mutant. As expected, the number of spontaneous SCEs was significantly increased in the sgs1/blm mutant. The authors then speculate on the initiating lesion for SCEs and from indirect assays infer that most of the events must initiate from a lesion other than a double-strand break (DSB). While I agree with the view that most SCEs probably arise from a single-stranded gap formed during replication, I don't think this is such an unusual standpoint. Most of the E. coli recombination community is well aware of the importance of recombination initiated at gaps, and fission yeast labs studying recombination at stalled replication forks have long argued that the events studied do not go through a DSB intermediate. Furthermore, the 2002 study by Fabre and colleagues (cited here) made a strong case that most spontaneous recombination must initiate from ssDNA gaps. I suggest the authors tone done the section stating it is generally assumed recombination initiates from DSBs. Subsection “The strand annealing activity of Rad52 is important for sister chromatid exchange”, last paragraph: I found the section on Rad52 requirement for SCE in the rDNA confusing. If Rad52 is required for Holliday junction formation in the rDNA, but not Rad51, it would suggest the Rad52 strand annealing activity is important. Yet rad52-Y66A, which is supposedly defective for the strand annealing function is proficient for rDNA recombination. Figure 4B: The rad52 null should also be shown. Claussin et al. apply a novel and fairly sensitive assay for crossing-over between sister chromatids (a.k.a. SCE) to the scoring of inter-sister crossovers in single budding yeast cells. They provide evidence that these crossovers occur in about 1 in 4 cell cycles, and that most occur within the ribosomal DNA. They also show that these intersister crossovers require Rad52, with a partition between rDNA and single copy sequences in terms of the dependence on Rad51 and on the annealing activity of Rad52. They also claim to show, based on death rates in rad52Δ cells, and on the failure of rad52 class C mutants (which lack annealing activity) to suppress the synthetic lethality of mus81 sgs1 double mutants and the slow growth of rmi1 mutants. This paper is interesting because it provides the first detection of intersister exchange in "normal" genomes, and provides evidence in further support of a partition between the rDNA repeats and the rest of the genome, in terms of recombination biochemistry. However, there is some question as to whether the frequencies of intersister crossovers reflect what happens in normal cells, and the argument regarding the relationship between double strand breaks and intersister crossovers is invalid. 1) Assay conditions might impact the frequency of recombinogenic lesions. In the strand-seq assay, cells are shifted from thymidine-containing medium into medium where BrdU is the only source of "T". Under these conditions, there are many non-physiological sources for induced damage. These include inefficient uptake or inefficient phosphorylation leading to decreased dNTP pools and subsequent fork stalling, recognition of incorporated BrU as a damaged base, removal by BER and subsequent post-replicative repair by recombination, or photolytic damage followed by repair by recombination. These are, of course, quite difficult to control for, and all might increase the observed frequency of intersister crossing-over beyond what occurs in the absence of BrdU. The only remedy that I can think of would be to incorporate one of the previously published assays for unequal sister chromatid exchange into the strains used, and compare rates of exchange genetically in cells grown in thymidine, cells subjected to BrdU as for the strand-seq protocol, and in otherwise isogenic CDC21 (i.e. wild-type) cells whose growth is independent of exogenous thymidine. 2) Cell inviability assays compare rates of death in cells grown in thymidine with rates of SCE in cells grown in BrdU. Because of uncertainty regarding whether or not BrdU induces additional SCE in yeast (see point above), the argument comparing SCE rates with death rates is currently invalid. 3) While a single DSB is sufficient to kill a rad52 mutant cells, this mostly occurs by irreversible DNA damage checkpoint arrest. It is not known whether or not a DSB in one of two sister chromatids is also sufficient to cause irreversible arrest. If it is, then these cells would not divide, and thus would be excluded from the spontaneous DSB rate assay, because they would not have divided. This would lead to an underestimate of lethality, and thus the frequency of unrepaired lethal lesions. In sum, a better assay for cell viability would take the same population used for strand-seq, and to plate cells after S is completed, but before the first mitotic division, on YPD + thymidine, and then scoring for both cells that fail to divide, and for cells where either mother or daughter are unable to form colonies. 4) Failure of rad52Δ or rad52-Y66A to suppress the lethality of a mus81 sgs1 double mutant, or the slow growth of an rmi1 mutant does not mean that the lesions responsible for the synthetic lethal or slow growth phenotypes are not double-strand breaks, just that Rad52 is not required for these lesions to form intermediates that require Mus81 or Sgs1-Top3-Rmi1 activity for resolution. The comments above should not be taken as suggesting that only double-strand breaks induce mitotic recombination, just that the evidence the authors have put forward is insufficient to prove their argument. Sister-chromatid exchange (SCE) is one of the major sources of genome rearrangement. However, SCE without rearrangement (equal SCE), that is thought to occur most frequently, has not been analyzed because of the identical sequence after recombination. To reveal the mechanism of SCE and the resulting genome instability, it is important to know the nature of equal SCE, too. The authors applied the Strand-seq method to yeast and mapped 57 SCE sites in analyzed 218 cells. 14 out of 57 SCEs occurred in the rDNA that is known as a hot spot of rearrangement (copy number variation). Interestingly, the authors speculated that most of the SCEs are not the results of DSB repair because frequency of the repair is estimated much less than that of SCE from the information of previous reports. The authors are presenting three models that make SCE possible without DSB repair. The conclusion is interesting and valuable to understand the actual mechanism of SCE. However, I think some descriptions in the paper are inappropriate. The authors should revise the following points before publication. 1) Subsection “Sister chromatid exchange at the ribosomal DNA locus”: HOT1 is thought to be an element that works outside of the rDNA by the function of pol I transcription (Huang and Keil, 1995: Ward et al., 2000; Serizawa et al., 2004, etc.). The recombination in the rDNA mainly depends on the replication fork barrier (RFB) activity by Fob1. The author should rewrite the sentence. 2) The authors discuss only about equal SCE. I wonder if they didn't find any rearrangement that really increases genome instability. They should add the information if they have. 3) What causes the SCE? Replication fork inhibition is thought to be the main trigger. I think it may be worth doing to test the effect of a replication inhibitor to the rate of SCE. This experiment may support the model but not essential for the conclusion of this paper. 4) Is there any hotspot of SCE? The authors should discuss about the sequences or regions in which SCE is induced. Thank you for resubmitting your work entitled "Double-strand breaks are not the main cause of spontaneous sister chromatid exchange in wild-type yeast cells" for further consideration at eLife. Your revised article has been favorably evaluated by Jessica Tyler (Senior Editor) and three reviewers, one of whom is a member of our Board of Reviewing Editors. Reviewers 1 and 3 are satisfied with the revision, but reviewer 2 is unconvinced that BrdU is not causing some damage that fails to elicit a checkpoint response or Rad52 foci. We don't really know what a Rad52 focus denotes, other than it is some kind of DNA damage. Rothstein's group has claimed, in fact, that multiple lesions are incorporated into a single Rad52 focus. Clearly cells with SCEs exceed cells with Rad52 foci by at least a factor of 2, and given observations that non-crossovers are formed in excess over crossovers in mitotic cells, it seems clear that most of the recombinogenic lesions formed are not detected as Rad52 foci. None of the assays the current manuscript contains directly address the question of whether or not spontaneous DSBs or SCEs occur at the same frequencies when cells are grown in thymidine versus BrdU. Ideally, one would want to measure spontaneous USCE using a genetic assay under the same conditions used here, one cycle of growth with BrdU. However, as noted in the authors rebuttal, there are technical issues with doing that type of analysis. All reviewers agree that there are a number of interesting findings presented, but given the concern over whether BrdU could cause damage and induce SCEs we suggest that you modify the title, something along the lines of "Direct measurement of sister chromatid exchange in single cells", and tone done the suggestion that DSBs are not the cause of spontaneous SCEs. In the revised manuscript, we have removed instances where we state that it is generally assumed spontaneous SCE events are initiated by DSBs. Also, we have cited the relevant E. coli and fission yeast studies (see first paragraph of the Discussion). We agree with the reviewer that this section needs more clarity. We find that neither Rad51 nor Rad52-mediated strand annealing are important for SCE at the rDNA locus. Our observation is consistent with that of Zou and Rothstein, who found that neither Rad51 nor Rad59 are important for the formation of spontaneous Holliday junctions at the rDNA (as we noted in our manuscript). Together, the evidence suggests that Rad52 may have a function independent of Rad51 and strand annealing. We have now revised the text accordingly. Rescue of rmi1∆ slow growth by rad52∆ has been previously reported (Chang et al., 2005). This reference has now been included. We have now measured Rad52 focus formation in the Strand-seq strain in the presence and absence of BrdU and found no significant difference (see new Figure 1—figure supplement 1). We also measured Rad52 focus formation in a wild-type CDC21 strain and found that focus formation is similar to what has been previously reported by Lisby et al., 2001 (PMID: 11459964). We believe that an unrepaired DSB on one of the two sister chromatids would indeed be sufficient to cause an irreversible arrest in rad52∆ cells, and the assay we used is designed to take this into account. We believe the confusion lies in how we described the assay. The goal of the assay is to determine the percentage of rad52∆ cells that die because of damage occurring during a single cell division. We could have isolated individual cells and asked how many of them could form a colony. However, if done this way, we would have included cells that may have inherited irreparable damage from the previous cell cycle (e.g. they were the products of checkpoint adaptation). This would have inflated the mortality rate. Thus, we instead dissected mother-daughter pairs to ensure that we were looking at healthy cells that had just divided. If a mother or daughter then acquires an irreparable DSB (because RAD52 is deleted), it will not form a colony and this would be recorded. We apologize for the confusion and have modified the text to clarify this point. To clarify, rad52∆does suppress the lethality of mus81∆ sgs1∆ and the slow growth of rmi1∆, but rad52-Y66Adoes not. Thus, Rad52 (but not its strand annealing activity) is required for the formation of the intermediates that require Mus81 or Sgs1-Top3-Rmi1 activity for resolution. Rad52 is required for DSB repair, strongly suggesting that the spontaneous lesions cannot be DSBs. This was the conclusion drawn by Fabre and colleagues, as mentioned by reviewer #1 and cited in our manuscript. We now refer to the replication fork barrier rather than HOT1. We indeed found evidence for other types of rearrangements. However, we currently do not have enough information to draw any conclusions. Using genetic unequal SCE assays, it has been reported by others (e.g. work from Mike Fasullo’s lab) that replication inhibitors and DNA damaging agents stimulate SCE. However, this does not conclusively indicate that replication fork inhibition is the cause of spontaneous SCE events. Nonetheless, it is an interesting idea, and we do plan to test in the future the effect of replication inhibitors with Strand-seq, but we believe this is outside the scope of the present study. As discussed in our manuscript, we have not been able to identify hotspots of SCE (beyond the rDNA locus) because (i) we do not have enough SCE events from our Strand-seq libraries and (ii) the resolution in mapping these events is currently insufficient to determine hotspots. We are happy to hear that our revised manuscript has been favorably evaluated by the senior and reviewing editors, along with the three reviewers. As suggested by the reviewers, we have now changed the title to “Genome-wide mapping of sister chromatid exchange events in single yeast cells using Strand-seq”. We also note that our experiment assessing the percentage of cells that exhibit a Rad52 focus after 90 minutes of growth in the presence of either BrdU or thymidine does not give an accurate representation of the percentage of cells that form a Rad52 focus during a single cell cycle. Our experiment only provides a snapshot at one specific point during the cell cycle for each cell. The Rothstein and Lisby labs have performed time-lapse experiments to follow Rad52 focus formation throughout the cell cycle in 10-minute intervals (see PMID: 17096599, 17591698, 21075850). They have found that ~50% of cells form a Rad52 focus per cell cycle. This is likely an underestimate because short-lived foci may have been missed between the time points. Therefore, our observed value for 3 the percentage of cells with an SCE is very much in line with the reported percentage of cells that form a Rad52 focus per cell cycle. We thank Phil Hieter and Jan Stoepel (Michael Smith Laboratory, UBC, Vancouver), and the UMCG Central Flowcytometry Unit, for technical assistance with the sorting of yeast daughter cells; Peter Thorpe for providing the E17 strain; Niek van Wietmarschen, Karina Hoekstra-Wakker, and Jorn Staal for technical assistance with Strand-seq library preparation; and Peter Stirling and Rodney Rothstein for constructive comments on the manuscript. Financial support was provided by a European Research Council Advanced grant (to PML) and a Vidi grant from the Netherlands Organisation for Scientific Research (to MC). © 2017, Claussin et al.